It has been a LONG time since I've gotten so excited about any airsoft gun. When they announced the KWA Kriss Vector earlier on this year at Shotshow, I was a bit skeptical as I've never been a huge fan of KWA products. I've only ever liked their MP7, but other than that, not a fan (apologies to KWA fans out there). After watching the videos and pics, I started to have a change of heart and the anticipation grew. 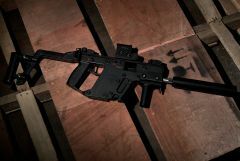 FINALLY, after almost a year, KWA finally released the KWA KRISS VECTOR this week. I was fortunate enough to get my hands on the first batch as they're almost sold out everywhere. Hot item I guess. Without further ado, here are my initial impressions (and pics! ): Box Contents (may vary from country to country): Box includes, 1x Kriss Vector, 2x Long Magazines (HK only I believe), 1x accessory rail, 1x front BUIS, 1x rear BUIS, 1 QD ring, 1x barrel thread protector, 1x vertical foregrip, 1x hop up adjustment tool, 1x sight adjustment tool, 1x instruction manual Externals are solidly built. Great polymer used and the stock is solid when extended out. When folded up, it clips into the receiver well. One thing I did notice was its weight. With the magazine in, the thing is not light. Rails are aluminum and zinc alloy charging handle & controls (could be steel but I have not yet tried it with a magnet). Fire controls are ambidextrous, crisp and click into place very solidly. I have yet to decide whether I like having separate controls for safety and fire select. That said, it is very different in weapon control ergonomics, that's for sure. Trigger is very crisp. KWA did a great job with the trigger design. There is almost no travel. Only things that aren't ambidextrous are the charging handle, bolt lock and magazine catch. I supposed this could be due to the side folding stock. One thing i noticed was that it took a little more force than I expected to pull back the charging handle. Not sure if this will loosen up over time. The bolt catch, although not being ambidextrous features a tab which enables you to lock back the bolt manually. As for the magazine catch, I don't particularly think it's in an intuitive place. It sits a little too high up on the magwell which is fine if you plan on just dropping your mag to the floor, but perhaps my hands are too small to be able to hold and remove the mag with one hand. I wish KRISS would have designed the mag release on the firing hand. OK on to the internals. KWA designed the KRISS VECTOR GBB to field strip exactly the same way the real steel one does. 4 identical pins hold the entire platform together. Inside, you'll find all STEEL parts. That's right, KWA did not go wrong on this part. Firing mech, hammer, sear, Super V mech and even the bolt is steel. Although this means you'll have to keep your gun well lubed, it should outlast that crappy pot metal that we oh so commonly see in stock GBBs. Kriss Super V System with metal bolt: The hop up is the new KWA style 2-pronged one. Still a hastle to tune but at least the tool is provided: Steel hammer, sear & selector system: Field Stripped: Magazines are proprietary to the KRISS. TOO BAD they didn't make Glock magazines work with the Kriss, but again I guess KWA never made a .45ACP Glock replica. The magazines are definately much larger. I'm a little iffy about the mags as the first one I got leaked out of the box and it had to be replaced. I've put a KWA Glock mag next to it for comparison: Shooting the Kriss is absolutely awesome. Not a whole lot of recoil (for obvious reasons), but it's remarkably straight. I ran a few tests through the chrono and it clocked at at about 340-350FPS (~1.4J with 0.25g BBs). Some more pics: Next to an FPG (lol): I'll be taking her out tomorrow for a game. So I'll let everyone know how it goes. Feel free to ask me questions and I'll try my best to answer them Props to AZNRIPTIDE859 on his moral support and reminding me to get this asap. Cheers mate! My Vector with Ace One Arms mag release, Magpul RSA, KWA Vector Rails on both sides (Streamlight TLR1-S on one, Streamlight pressure pad on the other).